EDINBURGH MONARCHS expect to be at full strength for Friday’s play-off semi-final second leg clash against Peterborough Panthers at Armadale after confirming that German ace Kevin Wolbert wll return to action for the first time in a fortnight. Wolbert, who suffered neck and shoulder injuries after taking a heavy fall in the recent German play-offs. received clearance from his doctor after his health improved dramatically over the weekend. Sam Masters, who has been suffering with a flu bug for the past week, reported that he is feeling better and on the road to a full recovery. If Monarchs can overcome a two-point deficit incurred in Sunday’s first leg against the Panthers, they will reach the Premier League Grand Final for the third time in a row. 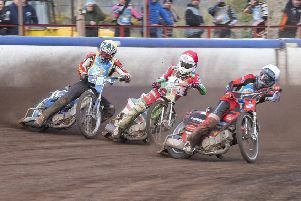 They will meet the winners of the other semi-final involving Somerset Rebels and Glasgow Tigers which goes ahead this weekend.